Home › Chronicling America › Happy 2011! Note the fuming factory smokestacks in the background of the picture–this is a recurring motif in newspaper illustrations of the day. While we in the 21st Century tend to look at the pall of black smoke and say “Yuck! Pollution!”, in the 19th and early 20th Centuries smokestacks are commonly used to symbolize wealth, industry, modernization, and desirable economic growth. Awareness of the negative impacts of environmental pollution would not begin to enter the broader American consciousness for a few more decades. 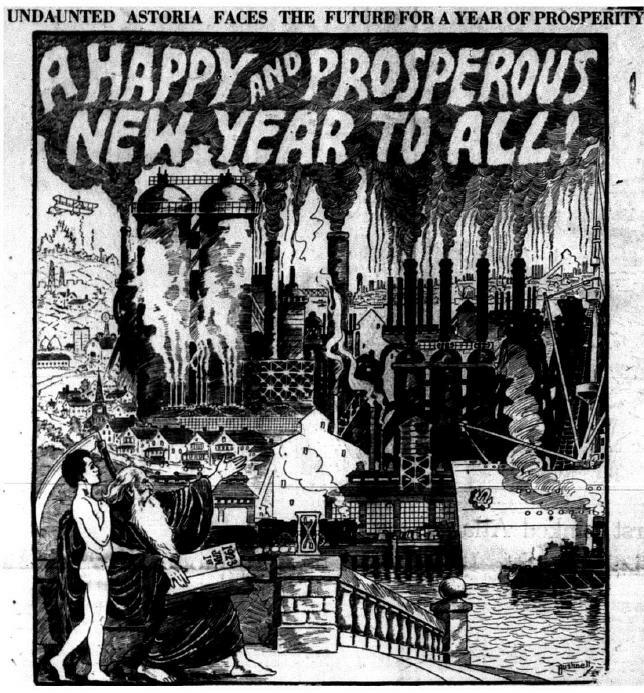 So this truly would have been the perfect image of a “Happy and Prosperous New Year” for most residents of Astoria in 1922.